Why I Should Never Get Up before Dawn. The other day I was startled awake by a dream. I had won exactly $43.2 million on some lottery or another. l soon realized it was just a dream, and that it was still dark outside. The green digits on the alarm clock told me it was 5:50 a.m. Husband was already up, of course, and I could sense a whiff of espresso coming from the kitchen. But he’s an early bird of some sort, and I’m a night owl. As real as they come. You see, after four years of getting up at exactly 4:15 a.m. to take my regular 7 a.m. flight to Washington D.C. and often beyond, I was done with early mornings. This night owl returned to her natural sleeping patterns as soon as she became her own boss. And her own scheduler. At least seven hours of sleep from early hours of the day until after sunrise. A recipe for a perfect day. So there I was, my eyes open. Bumble was sleeping sideways in the middle of the bed, snoring. I wanted to go back to sleep, but after just losing over $43 million in a blink, I couldn’t. I was fully awake. And the smell of coffee soon lured me into the kitchen. Husband looked up from his laptop like he was seeing a ghost, but only said “you’re early”. Quietly. He knows it’s not advisable to start any kind of intellectual exchange with me at that hour. 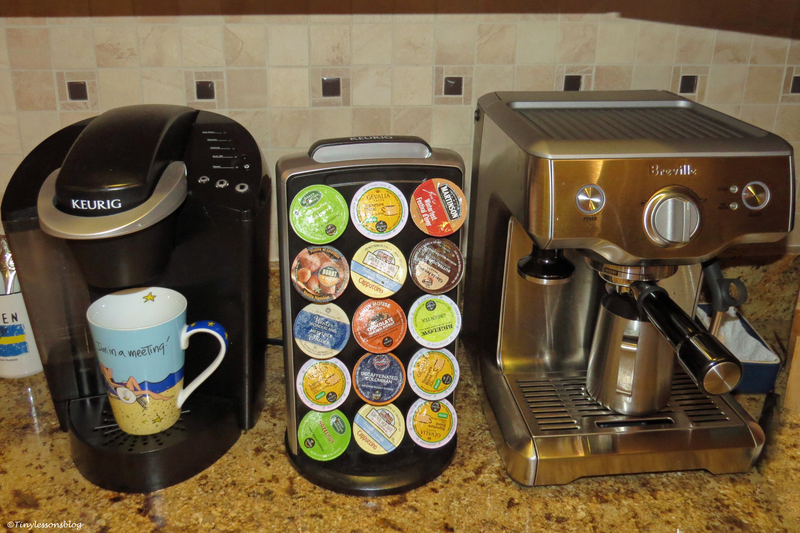 I could never imagine operating the espresso machine first thing in the morning, so I turned to my faithful Keurig. It knows what I want. And despite having to wake up at this unusual hour, it managed to make me a mug of decent coffee. I walked to my office to enjoy the life affirming brew. And to read some blog posts. Wisely, I didn’t comment on any of them. But I’m sure some early risers among blogging friends lifted an eye brow seeing a “like” from me at that hour. Soon my world started to turn red. The first rays were coloring the sky above the bay. It was beautiful. A reward for getting up early, I thought. Looking out, I got a brilliant idea. 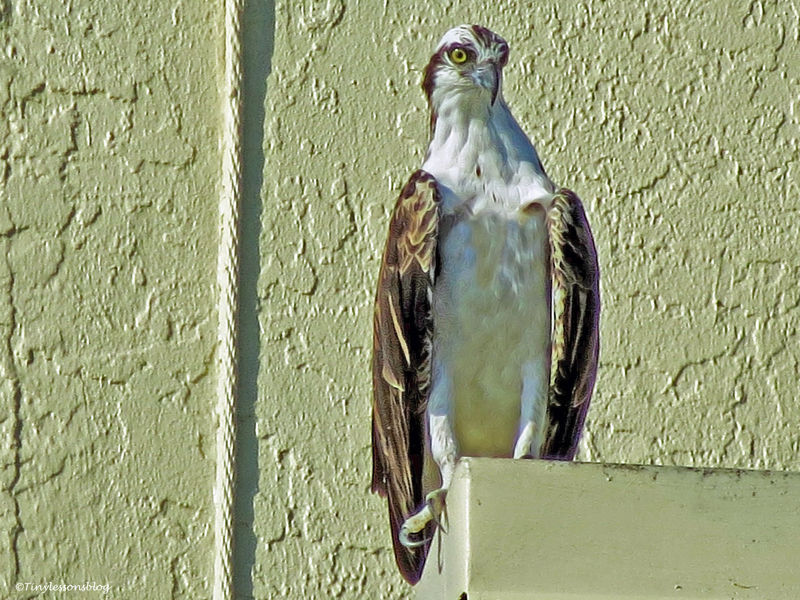 I would surprise Mama Osprey by appearing at sunrise on the bay side where she usually starts her day. So out I went. 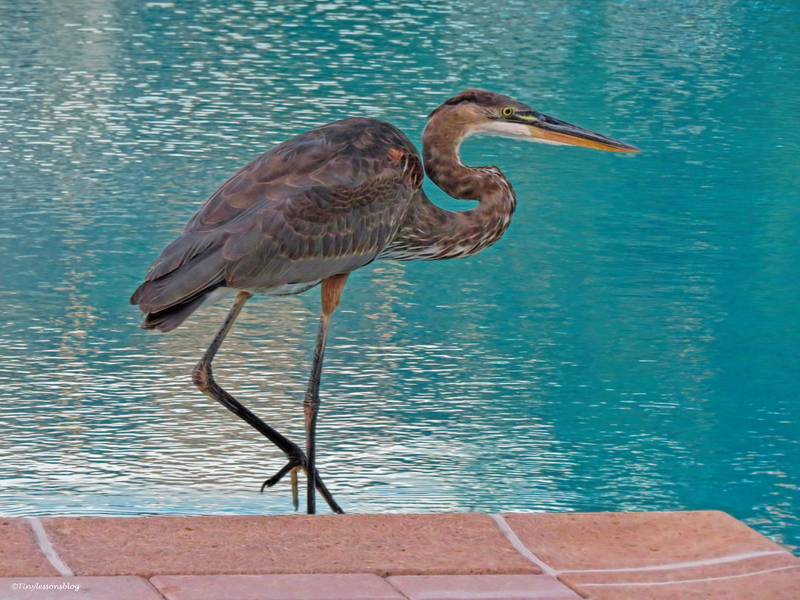 And met the young Great Blue Heron right at our pool. He’s not shy, as many of you know. He walked around the pool and calmly posed for the camera. I chuckled and shot away. Even considered forgiving him the attacks on the osprey nest last spring. But the light was so dim that of all the photos I took, only this one was salvageable. Later it was obvious to me that the camera has far more settings than the espresso machine. I should remember that for the future. Then I walked across the street onto the bay side without an incident. And spotted a huge flock of young Brown Pelicans, I’m guessing forty to fifty, silhouetted against the sun just peeking over the horizon. There was a chaotic flying, diving and eating frenzy all over the bay. I had never seen anything like that and happily shot away. About 160 frames capturing their non-stop action. Against the sun most of the time. It couldn’t be that bad, could it? You guessed it. Yes it could. And it was. 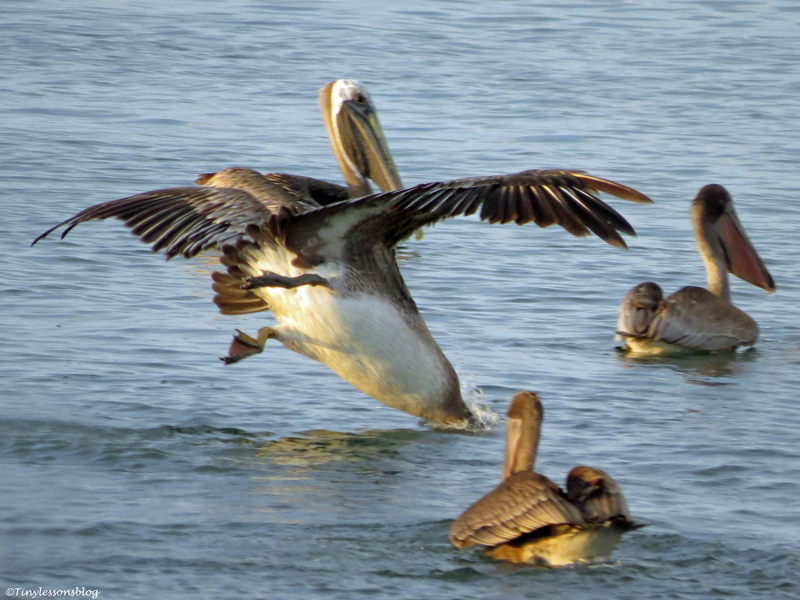 Of all the fast action by these wildly entertaining pelicans, only two lame pictures were almost worthy of posting. Most shots were just showing a blur of pelicans on the top of each other, dark silhouettes, or pink water splashing around. But I didn’t know it at the time, of course. I almost never look at my pictures until at home. So strengthened by having captured such lively action, I walked towards the sailing center. The sun was now looking over the bay from a somewhat higher position. I heard osprey speak. Looking around I continued walking. And right then my foot found a large hole in the grassy patch I was crossing. A perfect trap. Everything flew around in the air. But only my knees hit the ground. My equipment wasn’t broken and my ankle wasn’t badly sprained. Redeeming piece of luck right there. Getting up, I spotted Papa Stanley sitting high up on Marriott’s lower roof behind me. He wasn’t scanning for fish. Instead he had turned to look down on me. Sympathetically. And soon I discovered Mama Sandy too. 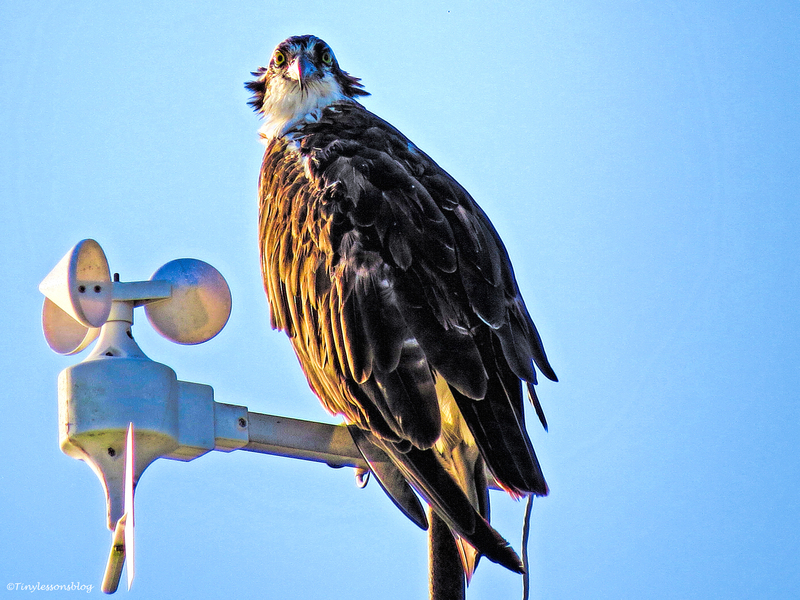 She was sitting on a wind measurement device at the sailing center. And had also turned around to look at me. I thought they’d both seen my fall and wanted to offer some consolation to this poor night owl with no wings. Or maybe they knew I needed some compassion after looking at my 220 frames from that morning? They didn’t tell. After finding both of them, I decided I’d tried my luck enough for one day, and returned home for a second cup of coffee. 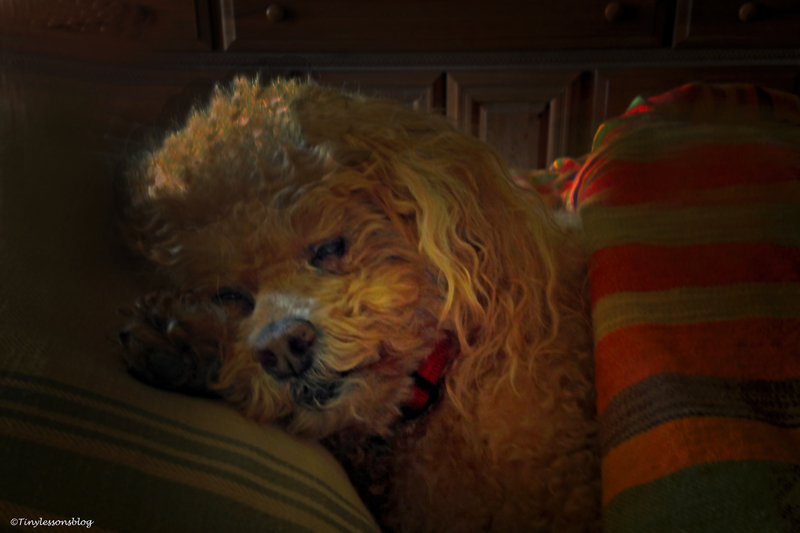 Inspecting the results of my worst photo shoot ever, I came to the conclusion that I should never get up before dawn. And try to act normal. Whether you are an early bird or a night owl, I hope you got up on the right foot. Previous PostBeach Walk – a HaikuNext PostSalt Marsh Gang and the Beach Boys. Live. Even your “bad” pictures are good! I’m an early bird, but that means evening events require that I be highly caffeinated. Early mornings mean I usually can spot a family of raccoons and the songbird chorus is in full swing. Thanks Michelle. I was quite disappointed in my abilities that morning. Too early for me. Luckily I didn’t hurt myself much in the fall. I like the times I can get up just after sunrise and go out little later. The light is better and most birds are out and about. I know there are raccoons in the salt marsh, spotting a family would be amazing. Very fun post. I enjoy the way you weave fun into your story and photo sharing. Sorry about the early mishaps, but it still sounds like a worthy adventure! I used to be an early riser, naturally. Now not so much. The earliest I rise is usually around 8.30 unless I have an early appointment somewhere. There were times I was a night owl also. I change course every few years it seems. 😉 Great pictures and I’m glad you didn’t hurt yourself. ‘Normal’ is highly overrated. I agree that “normal” is overrated 🙂 I’ve always been a night owl. Used to do my best studying at college between midnight and three in the morning. The commuter years were tortuous for me. I still don’t know how I managed to drive to the airport and always catch my flight – where I usually got almost two more hours of sleep. Have a wonderful rest of the week, my friend! 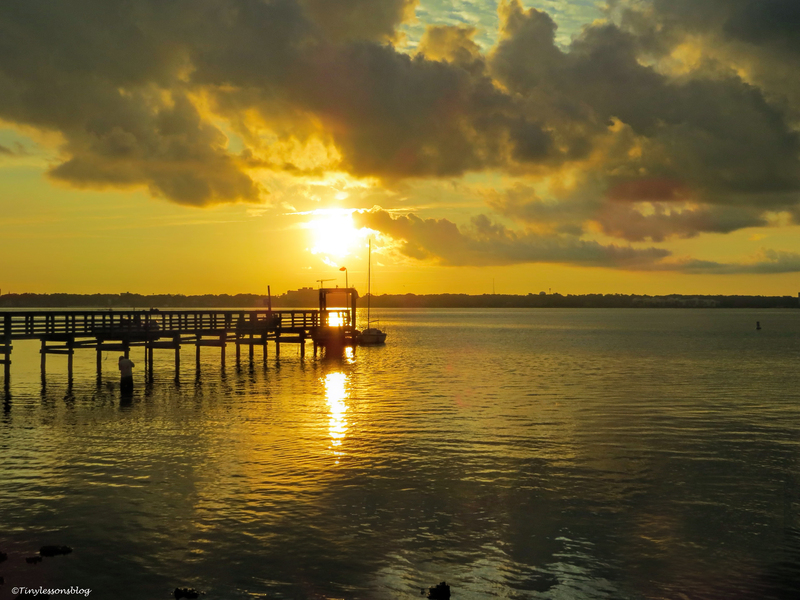 Breathtaking sunrising scene, Papa Stanleys and Mama Sandy’s visit, bird… Priceless!!! Glad you liked the story, Amy. The sunrises on the bay and the sunsets on the ocean are beautiful. I witness many more of the latter 🙂 I liked how both Ospreys looked at me. Like offering some consolation after my fall. I really enjoyed these photos from your “worst photo shoot ever.” I was intrigued by the lighting. Hope you heal quickly! There is no better way to get over a tragedy then with laughter, and here tonight you lifted my spirits immensely. I have a very challenging day tomorrow where I must look my best for someone who is gravely ill and who does not know the extent of what I have been through lately. So a good night’s rest, a good hair day tomorrow (from my lips to God’s ear! ), the magic of makeup and lipstick, sparkly jewelry, and beautiful colors worn on me. A scarf perhaps slung around my neck, snappy if you will. The sun must come out sometime. I listened recently to a short video that encourages those who are in the “dark times” and the rationale for those dark times. I hung on to every word. 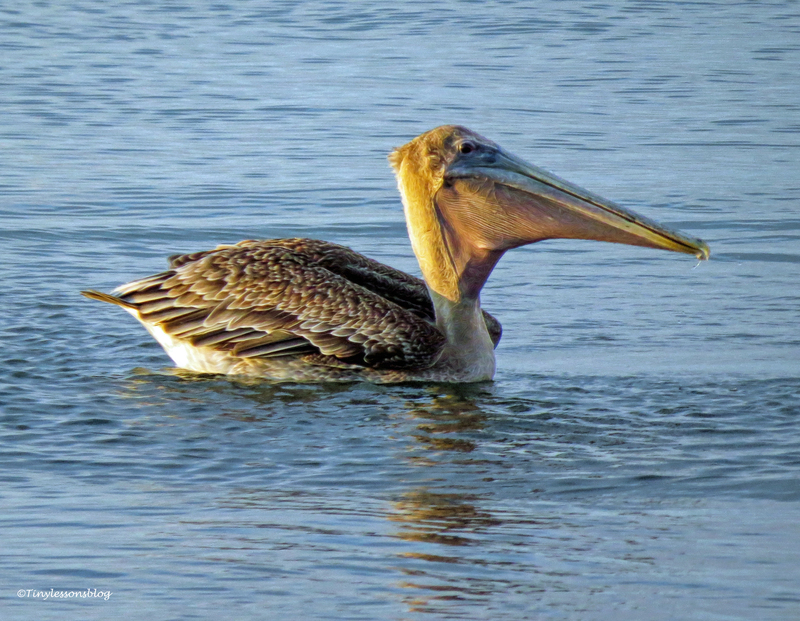 You captured THOSE terrific osprey, pelican, and sunrise shots that are clearly full of personality, and you call it your worst photo shoot ever? I LOVE these pictures, especially the expressions on the faces of Papa Stanley and Mama Sandy. Go on…get up early another morning. I can’t wait to see the pictures! You made me smile, Skip. I agree that the expressions on the faces of both Sandy and Stanley after my fall were worth getting up early. I still don’t know what I was thinking shooting the pelican action…probably not thinking at all 🙂 Thanks for your encouragement! Oh, that’s a nice interpretation of the dream! Hopefully the project I’m bidding for will come through… that would be a good outcome. If this night owl will get up that early again, she better learn to fly first 🙂 Thanks Karen. We benefited from your early morning, even if you did not. 😉 Glad you weren’t badly hurt. Bumble looks very sweet. Thank you, happy you enjoyed. Bumble looks really fluffy and handsome today after a morning visit to the groomer 🙂 He says hi to you! Tiny, ahhhh, another night owl kindred spirit! OUCH! Hope your ankle isn’t worse for the wear. And bummer about all the shots that were nots! BTW: I sent you an e-mail with a link to some winning nature photos. I’m glad you’re okay. Let the early birds keep and let the owls have the nights. I’m almost as good as new now. This owl needs her night…until she sees the light 🙂 Thanks Bruce. Thanks Julie. Please see Karen’s comment above…not bad to have those dreams. Right! You were up too early. Nice to have some good company in the WP owl family. Who who. Is it the angle,or is Sandy looking “fuller” than usual? I know she looks much fuller, but I think it was the unnatural angle as she had turned backwards to look at me. I saw her yesterday (when my ankle tolerated some walking again) at the nest, and she was her slim and well-put-together self. If those are your bad pictures then I think I should go back to bed – for the day! Sorry to hear about your fall – Hope you have a great weekend and get to sleep in! You’re so sweet, Helen! 😊 I feel that your photos are so inspiring! As a fellow sufferer from falling into a hole while prospecting a photo opportunity, I couldn’t help but laugh at your misfortune. When will we ever learn, when will we ever learn. I am glad that you took no hurt and even more importantly that your camera gear survived too. This was actually the second time for me. I didn’t learn the first time, but hopefully now I will. I’m happy that I could swing my gear in the air so it was “unhurt”. It is unlikely that I will ever learn. Aww, thank you David. That makes up for at least hundred frames of non-pictures. I had to look again to make sure they weren’t laughing 🙂 But they sure saw my “performance”, which luckily ended quite okay. Thanks Sylvia. Have a great weekend. I’m so glad you weren’t hurt and your camera was intact! Beautiful images and the expression on your osprey friend’s faces are just priceless. I came across an osprey while in California and got a few quick captures..not very good captures but I thought of you when I spied her! I consider myself lucky because these ospreys are non-migratory and stay here in the vicinity all year round. They know me by now and it was funny that my fall was more interesting than fish that morning. Nice that you saw an osprey while in California! I love the early mornings for their beauty, but somehow they don’t love me back. It takes me some time to wake up on a (for me) normal morning, and that time grows exponentially when I get up before dawn. And things tend to happen. I have never before deleted 200 frames straight to the trash bin or found the only hole in that grassy patch 🙂 Thanks for your nice comment, Randall.